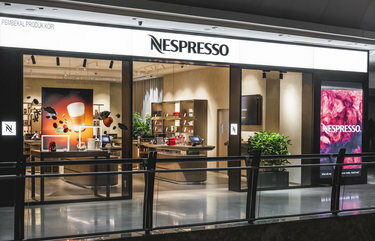 Nespresso opens an innovative new Boutique concept in The Gardens Mall, Mid Valley City the first in Malaysia. Surrounding guests in an immersive coffee experience the new Nespresso retail environment allows for deeper learning and coffee exploration. 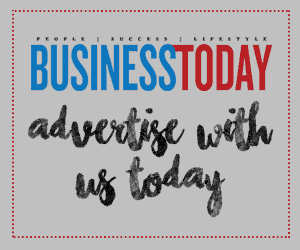 This unique and brand-expansive concept first launched in Cannes, France earlier this year and is now being rolled out around the world. Throughout the Boutique, visitors will experience elements that reflect Nespresso’s deep commitment to sustainability and adherence to a circular economy, one that is restorative by nature and works to minimise waste through careful design. 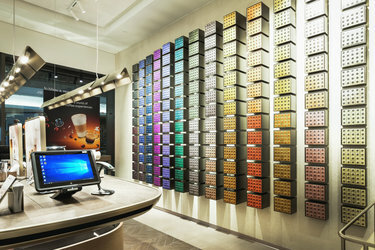 Nespresso has set an ambitious goal to achieve a network of 100% environmentally friendly Nespresso Boutiques by 2020. This will be possible thanks to a certified protocol which measures carbon foot print reduction for each new boutique opening. The new concept demonstrates this commitment with elements such as table-tops made from used coffee grounds from the Nespresso factory in Switzerland, wood that has been 100% sourced from reforestation programs. The contemporary and luminous space invites guests to explore new coffee tasting rituals. The new experiences include A Sensorial Welcome whereby upon entering the Boutique, Coffee Specialists introduce guests to the vast range of coffees in which guests can get hands-on with the coffee grounds inside a capsule, discovering the aromas and then finishing with a tasting experience. For Discovery at the Bar, guests continue their journey through the Boutique, perusing the smart and easy-to-use machines and accompanying accessories, a Coffee Specialist will assist them in exploring the coffee range further. They can taste two coffees side-by-side in order to better understand their taste preferences and the full range of 24 Grands Crus. 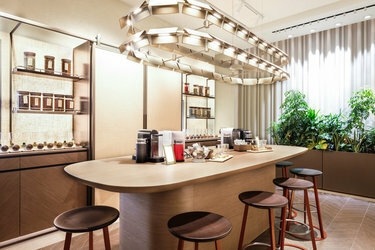 The new Nespresso Boutique concept and open format was designed by award winning architecture and interior design practice, Universal Design Studio which was founded by Edward Barber and Jay Osgerby.